This article was published in the Metro on 28th November. According to 19th century scientists, if a frog is placed in tepid water that is very gradually heated to boiling point, although it’s physically capable of jumping out of the water, the frog does not. It strikes me that all too often this is how we are at work: the temperature of our respective professional environments is heating up around us – we stay late, we answer emails early, we miss kids’ bed times, and the water is boiling. But most of us just don’t jump. So, when I saw the news about the Goldman Sachs initiative of providing emergency nanny cover for employees with sick children, I initially thought it was a great idea. It seemed like a good way of turning down the heat on working parents and making life a bit easier. However, the more that I thought about it, the more I started to worry – because what the initiative actually does is downplay the importance of parenthood. The message that I took from it was that an ill child should not interfere with the regular working day – work should come first. This despite recent research by CIPHR revealing that 75% of working parents experience stress and anxiety when trying to implement a work-life balance. If companies could stop thinking about monitoring working hours and start assessing work impact instead, then as a workforce would all be happier, healthier, smarter and wealthier. This seems as old-fashioned as the 19th century frog scientists, and it’s counterproductive – neither good for the workspace, nor the children. Surely what we should be doing is creating structures that allow for parental flexibility, and the ability to ensure sick children are not simply outsourced to a stranger. Last week I was on a Skype call with a client based in Copenhagen. As the time approached 5pm, they said that they’d like to end the call as it was getting late and they all wanted to have dinner with their children. I was amazed, struck by the fact that none of them apologised for it – they simply stated that they were heading home to their families. What really stood out was that they were all men. Thinking about the Goldman Sachs emergency childcare coverage, I later asked one of them what he would do if his child was sick. He answered immediately that either he or his wife would work from home that day. I pushed further to see if he felt he would be letting down his team, or that his work would suffer because he was choosing to work remotely and take care of his child – he genuinely could not understand the question. In the UK, we are too often worried that we’ll get it wrong. But thankfully, there are changes that seem to be taking place. Time-wise, the organisation behind the Part Time Power List initiative, is celebrating organisations that are battling the culture of ‘presenteeism’, and allowing men and women the flexibility they need. So while I applaud Goldman Sachs for attempting to shake off its ‘bleed to succeed’ image by implementing initiatives like this – along with adding payment for IVF and gender reassignment costs to its benefits plan – I’d be more impressed to see systematic changes in the City and beyond for working parents, in order to reduce anxiety and stress. If companies could stop thinking about monitoring working hours and start assessing work impact instead, then as a workforce would all be happier, healthier, smarter and wealthier. Productivity has nothing to do with being chained to a desk; technology allows us all to work in a way that fits the demands of the 21st century. Amelia Torode chaired The Drum’s Agency Business Awards. These prestigious awards highlight best agency practise in UK and beyond. Winners will be announced on the 27th November. We've been thinking about Pacers and Role Models at The Fawnbrake Collective. Let's start with what we think about Role Models. We hate them: A spurious concept, inherently flawed. The idea that we should all be looking for people that you want to be like, in a kind of “Single White Female” way (excuse the early 90s movie reference) is scary. No-one has got it all figured out, No-one’s lives are perfect. Role Models just leave both parties disappointed. It doesn't work as a concept. We are however extremely interested in the concept of Pacers, or to be more precise “Professional Pacers.” We've been thinking about the marathon runner Eluid Kipchoge and his attempt last summer with Nike to break the 2 hour marathon, #Breaking2. To run faster than anyone had ever done before, Kipchoge needed to run smarter than ever before and he did that with Pacers. A squad of elite athlete companions, stars in their own rights, who could help him speed up, or for that matter slow down, to break a new world record. The Pacers ran in small groups of 3 alongside Kipchogue and each mini-team focused on a different section of the marathon distance. We don’t need role models that look like us to attempt to emulate, we need pacers to run alongside. It doesn’t matter how old that person is, or what level of seniority, the only thing that matters is impact. Professional Pacers help you to run further, faster. The thinking around Professional Pacers fed into our organizational structure. We'd like Fawnbrake to be a collective of professional pacers helping other work smarter faster. The Role Model is dead, long live the Professional Pacer. The Fawnbrake Collective, a new operating system aims to disrupt traditional agency model. London, 25th September 2017 - Former TBWA\London Chief Strategy Officer and award-winning strategist Amelia Torode today launches The Fawnbrake Collective, a new operating system designed to disrupt the traditional advertising agency model and a new approach to talent optimization and creativity. Recent research has confirmed that people in the UK want to work in a different way. The demand to work differently cuts across all generations, at all life stages and for many different reasons. The UK’s advertising sector however has yet to catch up. 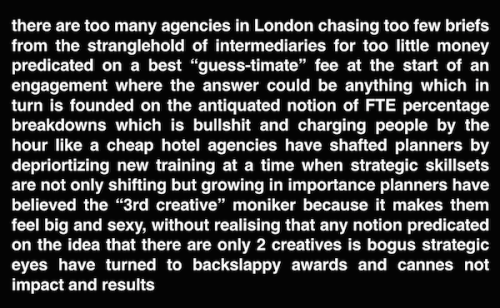 While the industry is packed with fine minds, deep thinkers and entrepreneurial visionaries, traditional agency structures are impeding creativity and we are witnessing an unprecedented talent exodus, either to go freelance or to leave the industry entirely. Torode has been working to identify key Collective members and names will be announced over the next weeks. Amelia has a formidable network to draw talent from having spent 20 years in London and New York working for agencies such as OgilvyInteractive, MindShare, VCCP, Naked Communications and TBWA. She began her career as one of the first WPP Marketing Fellows and has built a deep expertise in technology. Campaign magazine call her a Trailblazer and named her “Planner of the Year” and in their top 10 of digital talent (“Torode’s blend of refreshing honesty and practical insight in genuinely inspiring”) She has been at the forefront of the flexible working revolution, the only person to have been featured twice on Timewise’s Part Time Power List, has talked at TEDx on the power of brands on the brain (www.bitly.com/TEDxTorode) and was recently cited as the 8th most influential marketer on Twitter. If I am honest, it all went a bit faster than I'd planned. This time last week the company had no name, no website, no client and a vague idea of how it might work. I knew what I wanted it to be and had written and talked about elements but somehow I hadn't managed to work out how they worked together and what they all meant. Then last Wednesday HiyaCar said that they wanted to hire (hiya?) me so suddenly it was all systems go. My mum passed away from cancer in June and her death really made me think about how I worked, who I worked with and what I worked on. Over the summer lots of friends IRL and people I've gotten to know on social media platforms offered support. I saw how collectives can work in practise and how powerful they are. The Fawnbrake Collective is my way about rethinking the old accepted rules of working. Creative and strategic talent is something that is not going to be outsourced anytime soon to a machine, but the structures that are in place are squandering that talent. I'd love Fawnbrake to be something different and better for everyone. This poster was hanging on the wall when I started work this morning and I loved it. As Alan Partridge might say "literally the writing is on the wall." I now think of this Fire Starters event as my Trainspotting moment ("choose life" etc) I'd come to Google directly from the chemotherapy unit I had spent the day with my mum was and I was angry and tired and fed up. So I just talked about all the stuff that was bugging me about the industry that I loved but that was seemingly floundering all around me. Brands can't be "beautiful wallpaper" that no one notices. Brands can't be "culture spam" or (my particular nemesis), "branded noise." In a noisy post-truth world, the best agency folk are sense makers and meaning makers and from talking with clients, that is exactly what they are looking for. If brands are made up of experiences + expectations, then the time feels right for a new way of approaching Brand Strategy & Experience Design. I was on Osea Island this summer for the second Off Grid Sessions and was chatting to an old friend. She used to be a planner on the agency side and had recently moved over to become a client, I'm going to call her Alex. Alex absolutely loved the ECD she had worked alongside with in her old agency - they just had the most briliant relationship and the creative ideas that they generated were award-winning. When Alex arrived at her new job, she tried to find out if she could hire her ECD for a few days a month, or to be at the end of a phone call when she need to bounce ideas off someone. The agency said no. Impossible it didn't work like that. You couldn't just hire individuals without the whole system. Alex was frustrated. The ECD was frustrated. The agency system and structure had got in the way of skillsets. That's when it struck me how hard it can be for clients to "buy" agency services. To use a restaurant analogy, It seems like agencies want clients to have the 5 course set menu complete with wine pairings, while increasingly clients want something a bit more like Yo Sushi - a bit of this, a plate of that, a taste of something else - all delivered to them quickly in a easy system, easy to order, easy to buy. A new flexible operating system needs to make doing business as easy as possible. Increasing that seems to be to strip away as much structure and systems as possible to let talent connect at a more senior and engaged level not only with the client but also with other people. I’ve had time to think about work over the past few months because I haven’t been there. I’ve been with my mum as she reaches the final chapter of her battle against cancer. My mum is really sick. It hurts her to talk, so often we just sit together as she dozes and I think. And I’ve thought a lot about work. When you are with someone you love who has not much time left, you start to think about how you are spending your time. Time, the world’s most precious and finite commodity. Time, the commodity that no-one – especially, it seems, agency folk – ever has enough of. Advertising agencies are unique beasts – fast-paced, exciting, full of challenges and characters but also full of tight deadlines, multiple clients to juggle and never-ending pitches that result in long nights and working weekends. Friends in other professions shake their heads in disbelief at the demands agencies make. You work like a banker or a lawyer, my banker and lawyer friends observe, but you don’t get paid like them. But we have so much more fun at work than you do, I reply. We didn’t go into advertising to make money, we went in to make ideas. And we do make ideas and culture. And it is fun but it is also demanding of time in a way that, as you start to age and build a family, feels particularly challenging. Sheryl Sandberg famously implored women to lean in, but what if you don’t much like what you’re leaning into? If you’re leaning into an expectation that life is there to be sacrificed upon the altar of advertising, maybe that’s something that just doesn’t work for you. Leaning out becomes an empowered choice, not a passive default. I’ve certainly been told that this is just how advertising works. It is what it is. But what if you can’t do the nights and weekends at the drop of a hat? What if you don’t want to postpone the holiday again? What then? All too often, it seems that to succeed in our industry you have to bleed for your agency. If you’re not prepared to do that, then someone else coming up the ranks will. Goldman Sachs-style hours become an (unpaid) expectation rather than a personal choice. Bedtimes (ours or those of our children) are missed, gym sessions are skipped and dinner dates cancelled. So we comfort ourselves in the belief that our ideas are making "dents in the universe" and that they are well worth the sacrifice. Linds Redding, a Saatchi & Saatchi and BBDO copywriter, famously wrote a biting blog post on his deathbed (cancer too) in which he looked back at his life in advertising and said: "It turns out it was just advertising. There was no higher calling. We were just shifting product." I believe we should call time on the myth of advertising’s higher calling. It’s a hard-working profession, not a life-or-death vocation. You shouldn’t need to bleed to succeed. We’re not, as I know full well, curing cancer. The professional expectations that are being placed on people are, I think, unsustainable in a world where we are all likely to have to work into our sixties or longer. Where are the older people in advertising? You have to have the stamina of a twenty-something to keep the pace in most ad agencies and that’s ridiculous. Our assets are our people, we all know that, but too often our industry uses young people like cannon fodder and burns out those with families or who have commitments outside the office. We’re facing a talent dearth of our own making. The world has changed beyond belief in the past decade. The empowered immediacy of a swipe right on Tinder, the transparency of pricing on the easyJet app and the continual affirmation and feedback on a platform such as Facebook have changed our cultural expectations but I don’t think the agency world has kept up. We need to redesign agency work structures and organisations to better suit the needs of creative workers or we will find that they will simply vote with their feet and walk away. From my vantage point of being temporarily out of the world of agencies, I’m worried that the people I see walking away fastest from our industry are women, often mothers, because the current structures seem too inflexible. Too often, personal lives have to adhere to outmoded and often inefficient working structures that, in the end, can require too great a family sacrifice. "Work your way" was the theme of this year’s Wacl Gather, which focused on providing honest conversations on coping strategies, struggles and finding success on new terms. We don’t need any more airbrushed case studies on work/life balance. If anything, they make matters worse for women. The audience at Gather was primarily female but the implications and opportunities should be felt across the industry regardless of gender. The conversation about designing work that works for people is a critical one – one I hope agency chief executives will be following with interest and will act on with conviction. 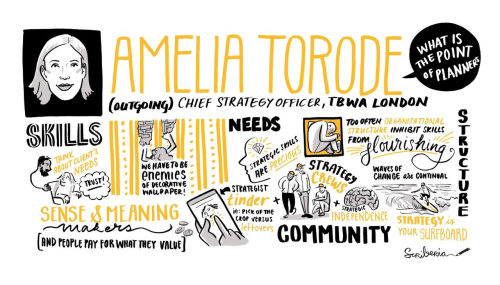 Amelia Torode is the former chief strategy officer of TBWA\London and a member of WACL.